My audiovisual practice began during my time as a member of music group Metamorphosis in the early 1980s, informed and influenced by and engaged in the post-punk/industrial music scene and based in Nottingham and Sheffield, England. A hybrid moving image practice combining Super 8 film, off-air video recordings, 35mm slides and original sound and music recordings was engaged in both as accompaniment to live music performances; expanded cinematic, multimedia, live audio-visual performances in their own right. As a 16 year-old growing up in the suburbs of Nottingham, closer to what Simon Reynold’s describes as the ‘bleak heartland of post-punk’ of Manchester and Sheffield than London, I was drawn into the ‘pandemic of samizdat culture’ (Reynolds, 2005, p. xvi) around 1979 by two school friends, Matthew Collin and Jonathan Tait; attending gigs locally and nationally and putting together their own fanzine Death or Glory of record and gig reviews, interviews, photos, local gossip and politics. Over the next couple of years I would join them in the fanzine production as Death or Glory mutated into Y. Establishing a network of contacts we moved into promoting concerts. Inspired by the punk ethos that you didn’t need to be a musician to start a band, and particularly by the D.I.Y. 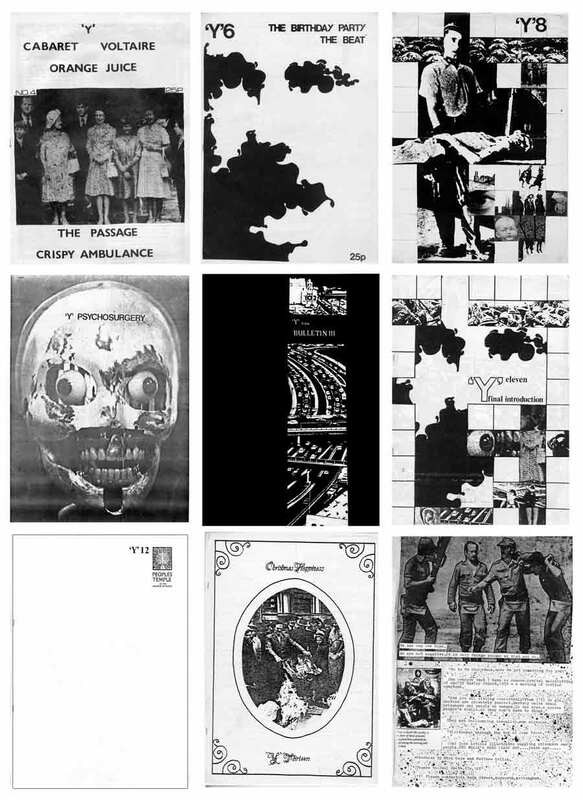 situationist informed ethos of Factory Records, Cabaret Voltaire and the various artists gathering around Industrial Records and Throbbing Gristle in London, we formed our own band in 1981, initially named Tiab Guls and later Metamorphosis. Sharing roles within the band we developed a percussive based music that combined tape-recorded sound and tape loops, guitar, bass and other instruments, playing concerts predominantly in and around Nottingham, Derby and Leicester, supporting some of the bands we were promoting and with whom we had connections including Section 25, Crispy Ambulance and 23 Skidoo. Metamorphosis would release one cassette on Leeds based Flowmotion Records, Conception 1982, contribute tracks to a number of compilation cassettes and release one vinyl LP Great Babel Gives Birth on Third Mind Records in 1983. Contemporary Super 8 film footage is montaged with posters, fanzines and reviews of Metamorphosis (formerly Tiab Guls) to the track ‘Fertile Ground’ released on the Flowmotion cassette ‘Conception 1982’, recorded live in Derby in June 1982, and mixed by 23 Skidoo’s Fritz Catlin. We took it upon ourselves to try and create the local scene we wanted, hiring small venues to host concerts, bringing bands from Manchester’s Factory Records to Nottingham, sharing the stage and the bill ourselves, sometimes with TV monitors. The multimedia element of the emergent industrial music subgenre became of particular personal interest. Concert posters, cassette sleeves and fanzine/magazine production called for design content, and live performances called for slide and film shows. 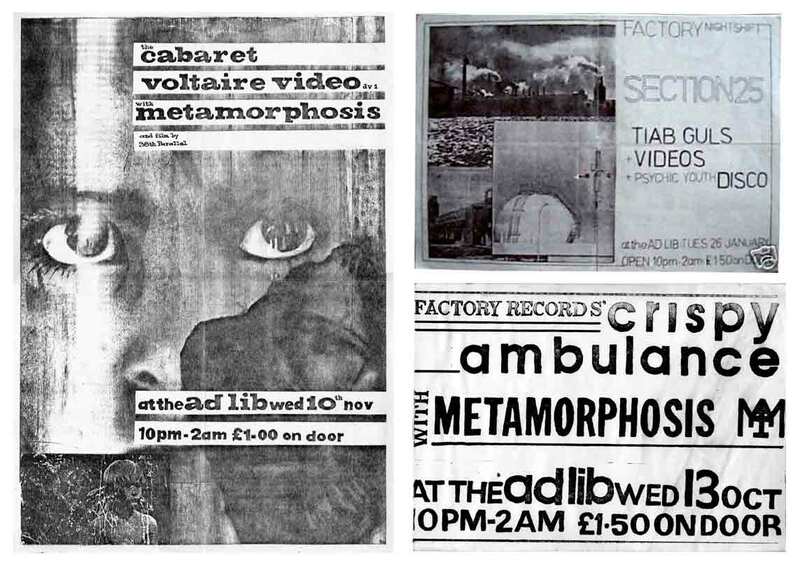 At the time of founding the Doublevision video and record label with Cabaret Voltaire, Paul Smith was based in Nottingham, and curated screenings of the Factory videos at the Midland Group Arts Centre in the Hockley area of the city, as well as supporting us in screening the Cabaret Voltaire video as part of a night of video and multimedia performance at the Ad Lib Club in Nottingham in November 1982, following a similar evening of live music by Factory Record’s Section 25, Tiab Guls and video screenings of the Factory ‘Video Circus’ we had put on earlier in January that same year. In June 1982, Metamorphosis supported 23 Skidoo in concerts at Derby Blue Note Club and Leicester University, once again sharing a multimedia bill, as 23 Skidoo toured with Richard Heslop whose amalgam of Super 8 and slide projections was an integral element of their live shows at this time . Metamorphosis: Conception 1982, audio cassette, (1982) Leeds: Flowmotion FM(C) 004; Rising from the Red Sand vol.2, audio cassette, (1982) Whitstable: Third Mind Records TMT05. The author on vocal duty. Metamorphosis; l-r, Meloni Poole, Jonathan Tait, Matthew Collin, Nick Cope. By 1983, I was concentrating much more on visual media, 391, and other creative engagements, having enrolled on Nottingham Trent Polytechnic’s Art Foundation course, and parted company with Matthew, Meloni and Jon, who would go on to produce the album ‘Great Babel Gives Birth’ and a number of other pieces as Metamorphosis over the next year or so. This would be the beginning of an ongoing partnership for me, working with Paul Smith to facilitate audio visual performances of various bands he was working with throughout the 1980s, that would later see me producing and screening two and half hours of film and video material to accompany the live concerts of Cabaret Voltaire in 1989-91. Doublevision later releasing Heslop’s video works for 23 Skidoo in 1984, Heslop going on to work as Derek Jarman’s cinematographer on a number of Jarman’s later projects, as well as becoming a music video and film director in his own right. Around 1982 I bought my own first Super 8 camera and projector, second hand from the back page ads in the Nottingham Evening Post for £20, starting to shoot a few rolls of Super 8 as well as experimenting with an old clockwork 16mm Kodak camera that had belonged to my grandfather. With a home rented VHS recorder, and the collaboration of a friend, Mike Noon, who worked in video rental store, and my cousin, Andrew Cope, working in a TV and video store, we were able to create crudely ‘crash edited’ tapes of off air footage and film clips to screen at our own gigs. Played back on old TV monitors from the rented VHS machine. We also copied images onto slide film and began to amass a collection of slides for projection at live performances. Our own multimedia practice was developing influenced by the artists and networks we were immersed in. I saw Tiab Guls a couple of times in the early 80s. The Blue Note gig in Derby with 23 Skidoo was wonderful. I stood near the front taking photographs and I remember an audience member asking me why I “wasn’t dancing?” (She had a point). I also think I saw a later incarnation – possibly Metamorphosis – supporting the Cure. Can this be true? In any case, the Nottingham scene in this period was very exciting. I saw O Yuko Conjugate a few times and still have some copies of old ‘Y’ and ‘Adventuring into Basketry’ fanzines. Thanks for documenting all of this material. we must have been at quite a number of other gigs at the same time too, I’m sure! I’m not sure about Metamorphosis supporting the Cure – certainly not whilst I was still in the band… though they continued for a year or two after I left and put out an album. I remember Adventuring into Basketry… more friends of the band… it was quite a trek down memory lane pulling all this together – much of which was for my PhD – in which I write at some length about those times… Did you go to the Ad Lib Club (as was) in Nottingham at that time? and the Boat Club? Are you still based in the midlands..? Hi Nick, a blogging contact of mine sent me a couple of Metamorphosis tapes recently – the Conception demo + a live show at the Ad Lib – & they’re both excellent. Bafflingly, I’ve lived in Nottingham all of my life (& have been interested in left-of-centre music since the mid 1980s) but I’ve never heard of your band(s) before – doubly frustrating considering I’m (still) rather fond of 23 Skidoo, et al. The archival stuff you’ve posted above is absolutely fascinating – the Crispy Ambulance show aside (which an older friend of mine attended, sadly I was still at school! ), I wasn’t aware of any of it, though I can just about remember seeing copies of Adventuring Into Basketry on the counter at Selectadisc, before I realised what a fanzine actually was (difficult to believe now, but I assure you’re it’s true!). 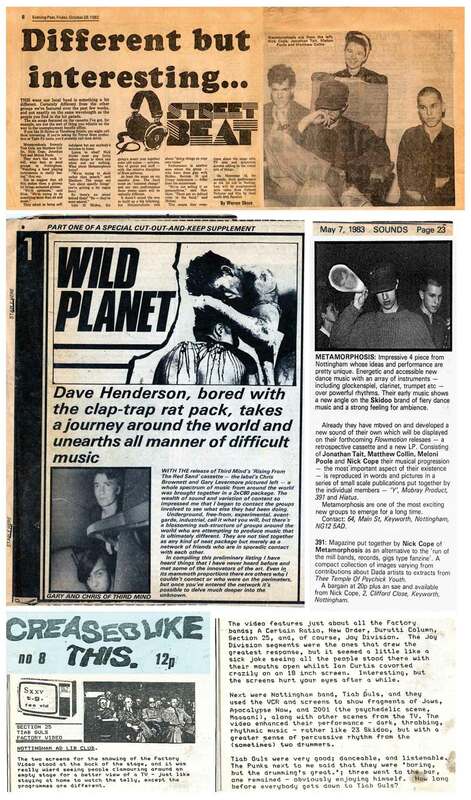 Somebody definitely NEEDS to put together a book about Nottingham’s underground scene from that era, I only caught the tail-end of it c/o The Garage & Rock City, etc but other people I’ve spoken to have given me the impression it was a relatively fertile period? Any chance you could extend your PhD & get it published? 🙂 Thanks / ‘bye for now, R.R.